Update: This appears to have been e a mistake (and inaccuracy) made by AMD’s Roy Taylor since the actual FP32 compute of Radeon Duo Pro is 16 TFLOPS. The VRLA Winter Expo was recently held in, well, Los Angeles, and AMD’s very own Roy Taylor hosted the proceedings of the official keynote. Apart from some expected channel and add-in-board partner information (included for those interested) Roy revealed something that had been eluding us so far. The exact, single precision compute number of AMD’s R9 Fury X2 aka Gemini Dual GPU. Roy Taylor from AMD presents at the VRLA Winter Expo. One of the earliest things mentioned in the keynote was the concept of VR as a Service or VRaaS for short. The model implies providing diverse VR services for the industry. This includes capture techniques, VR rebuilding techniques, AR and sound capture amongst other things. The second thing Roy touched upon is the fact that FirePro has been breaking a lot of ground in the professional graphics support department. Most of the video industry has been CUDA exclusive in the past decade, but this is something that could very well change. As can be seen in the material presented at VRLA, AMD’s FirePro platform is now certified for all the major name such as Nuke, DaVinci Resolve, Maya, 3DS Max, et al. Mainstream programs like Adobe Photoshop and After Effects have fully supported FirePro since a long time. 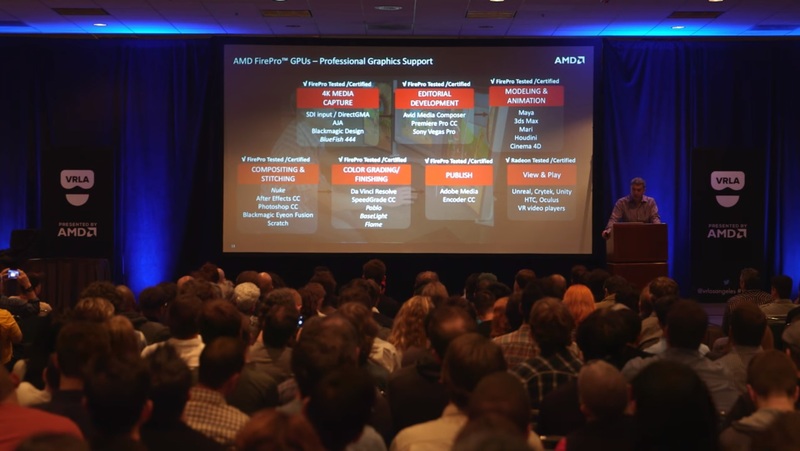 He also recapped AMD’s increased focus on drivers in recent times – specifically RTG’s Crimson driver initiative – which involves not only a complete cleanup of the code itself, but the GUI as well. If there were any existing complaints of AMD’s drivers not being up to the mark (against Nvidia), that is something no longer true. DX12 and LiquidVR also made a short appearance on the presentation – which makes sense since LiquidVR is basically one of the primary SDK’s for tackling VR from AMD’s side. DirectX 12 and LiquidVR would allow developers to unlock the maximum potential of Radeons and handover explicit control over the functions, allowing for greater VR. Polaris GPU once again made an appearance and Roy talked about the benefits of the 14nm FinFET architecture used to design the GPU and how it will help shape the VR Industry. In the end he talked about how VR cannot be judged solely by the amount of HMDs sold – because VR has the potential to be everywhere. Not just for gaming, but for quite literally – everything. I have been saving the best for last, because one of the things that Roy finally revealed was the single precision compute number of the Fury X2 dual GPU. Its worth mentioning that the card was being demoed in a SFF Tiki PC and was given away to a lucky winner at the end of the show. 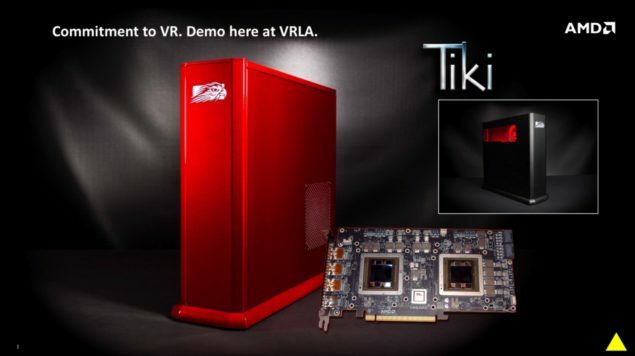 A slide from the expo showing the Fury X2 besides the Tiki SFF PC. Cooling type was not specified.